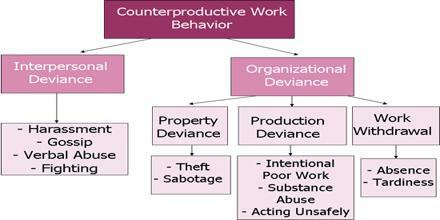 Counterproductive Work Behaviour at work is a huge issue which can have severe consequences. At least 30% of all businesses are believed to fail due to counterproductive work behaviours. It is an umbrella term that refers to intentional behaviour by employees that harms or intends to harm an organization or the people in it, including employees and customers. Counterproductive work behavior in the workplace can take many forms, from difficult personalities that damage team cohesion to employee theft that undermines your organization’s financial well-being.